Georgia i/ˈdʒɔːrdʒə/ is the Western exonym for the nation in the Caucasus natively known as Sakartvelo (Georgian: საქართველო, [sakʰartʰvɛlɔ]). The Russian exonym is Gruziya (Грузия). The native name is derived from the core central Georgian region of Kartli i.e. Iberia of the Classical and Byzantine sources around which the early medieval cultural and political unity of the Georgians was formed. Both the Western and the Russian exonyms are likely derived from the Persian designation of the Georgians, gurğān, from an Old Persian varkâna "land of the wolves" (also reflected in Armenian Virk' (Վիրք) and a source of the Greco-Roman Iberia). 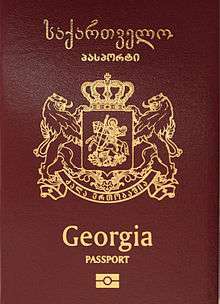 The front cover of a Georgian passport showing the name of the state in Georgian and English. The native Georgian name for the country is Sakartvelo (საქართველო). The word consists of two parts. Its root, kartvel-i (ქართველ-ი), originally referred to an inhabitant of the core central Georgian region of Kartli – Iberia of the Classical and Byzantine sources. By the early 9th century, the meaning of "Kartli" was expanded to other areas of medieval Georgia held together by religion, culture, and language. The Georgian circumfix sa-X-o is a standard geographic construction designating "the area where X dwell", where X is an ethnonym. The earliest reference to "Sakartvelo" occurs in the c. 800 Georgian chronicle by Juansher Juansheriani. Within the next 200 years, this designation was reconfigured so that it came to signify the all-Georgian realm which came into existence with the political unification of Kartli/Iberia and Apkhazeti under Bagrat III in 1008. However, it was not until the early 13th century that the term fully entered regular official usage. The memory and dream of a united Georgia – Sakartvelo – persisted even after the political catastrophe of the 15th century when the Kingdom of Georgia fell apart to form three separate kingdoms: Kartli, Kakheti, and Imereti, and five principalities: Samtskhe-Saatabago, Mingrelia, Guria, Svaneti, and Abkhazia. Thus, the later kings did not relinquish the titles of the all-Georgian monarchs whose legitimate successors they claimed to be. The idea of all-Georgian unity also dominated history-writing of the early 18th-century Georgian scholar and a member of the royal family, Prince Vakhushti, whose Description of the Kingdom of Georgia (agtsera sameposa sakartvelosa) had a noticeable influence on the latter-day conception of Sakartvelo. Although Georgia was politically divided among competing kingdoms and principalities during Vakhushti’s lifetime, the scholar viewed the past and present of these breakaway polities as parts of the history of a single nation. Georgia fell under successive Ottoman, Iranian (Safavid, Afsharids, Qajars), and Russian rule during the 15th to 19th centuries. It was re-united as the short-lived Democratic Republic of Georgia (საქართველოს დემოკრატიული რესპუბლიკა sakartvelos demokratiuli respublika) on May 26, 1918, transformed into the Georgian Soviet Socialist Republic (საქართველოს საბჭოთა სოციალისტური რესპუბლიკა sakartvelos sabchota socialisturi respublika) in 1921, and eventually gaining independence as the Republic of Georgia (საქართველოს რესპუბლიკა sakartvelos respublika) on November 14, 1990. 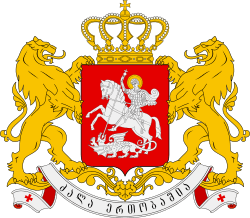 According to the 1995 constitution, the nation's official name is საქართველო sakartvelo, with "Georgia" given as its English equivalent. In other Kartvelian languages, like Mingrelian, Georgia is referred as საქორთუო sakortuo, in Laz it's ოქორთურა okortura, when in Svan it uses the same name as Georgian does, საქართველო sakartvelo. This same root is also adopted in Abkhaz and Georgia is referred as Қырҭтәыла Kyrţtwyla (i.e. Sakartvelo). The European "Georgia" probably stems from the Persian designation of the Georgians – gurğ, ğurğ – which reached the Western European crusaders and pilgrims in the Holy Land who rendered the name as Georgia (also Jorgania, Giorginia, etc.) and, erraneously, explained its origin by the popularity of St. George (Tetri Giorgi) among the Georgians. This explanation is offered, among others, by Jacques de Vitry and Franz Ferdinand von Troilo. Another theory, popularized by the likes of Jean Chardin, semantically linked "Georgia" to Greek γεωργός ("tiller of the land"). The supporters of this explanation sometimes referred to classical authors, in particular Pliny and Pomponius Mela. The "Georgi" mentioned by these authors (Pliny, IV.26, VI.14; Mela, De Sita Orb. i.2, &50; ii.1, & 44, 102.) were merely agricultural tribes, so named to distinguish them from their unsettled and pastoral neighbors on the other side of the river Panticapea (in Taurica). In the 19th century, Marie-Félicité Brosset favored the derivation of the name Georgia from that of the river Mtkvari via Kuros-Cyrus-Kura-Djurzan. According to several modern scholars, "Georgia" seems to have been borrowed in the 11th or 12th centuries from the Syriac gurz-ān/gurz-iyān and Arabic ĵurĵan/ĵurzan, derived from the New Persian gurğ/gurğān, itself stemming from the Ancient Iranian and Middle Persian vrkān/waručān of unclear origin, but resembling the eastern trans-Caspian toponym Gorgan, which comes from the Middle Persian varkâna, "land of the wolves". This might have been of the same etymology as the Armenian Virk' (Վիրք) and a source of the Greco-Roman rendition Iberi (Ἴβηρες), the ethnonym already known to them as a designation of the Iberian peoples of the Iberian Peninsula. "Hiberia" i.e. Iberia on Tabula Peutingeriana. One theory on the etymology of the name Iberia, proposed by Giorgi Melikishvili, was that it was derived from the contemporary Armenian designation for Georgia, Virkʿ (Armenian: Վիրք, and Ivirkʿ [Իվիրք] and Iverkʿ [Իվերք]), which itself was connected to the word Sver (or Svir), the Kartvelian designation for Georgians. The letter "s" in this instance served as a prefix for the root word "Ver" (or "Vir"). Accordingly, in following Ivane Javakhishvili's theory, the ethnic designation of "Sber", a variant of Sver, was derived the word "Hber" ("Hver") (and thus Iberia) and the Armenian variants, Veria and Viria. The Armenian name of Georgia is Վրաստան Vrastan, Վիրք Virk (i.e. Iberia). Ethnic Georgians are referred in Armenian as Վրացիներ (Vratsiner) literally meaning Iberians. 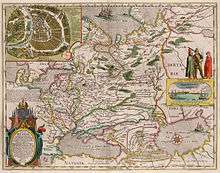 "Map of Russia" commissioned by Feodor II of Russia and published by Hessel Gerritsz in Amsterdam mentions "Iveria sive Grusinæ Imperium" i.e. Iberia or the Empire of Georgia. The Russian exonym Gruziya (Грузия ['gruzʲɪjə]) is of Persian origin, from Persian: گرجستان Gorjestân (Turkish Gürcistan Gurjistan, Ossetian: Гуырдзыстон Gwyrdzyston). The Russian name first occurs in the travel records of Ignatiy Smolnyanin as gurzi (гурзи) (1389) and Afanasy Nikitin as gurzynskaya zemlya (Гурзыньская земля, "Gurzin land") (1466–72). The Russian name was brought into several Slavic languages (Bulgarian, Belarusian, Croatian, Polish, Czech, Serbian, Slovak, Slovenian, Macedonian, Ukrainian) as well as other language historically in contact with the Russian Empire (such as Latvian, Lithuanian, Estonian, Hungarian, Yiddish, Kyrgyz, Turkmen, Uyghur, Chinese, Japanese, Korean). It also entered the contemporary Hebrew as גרוזיה ("Gruz-ia"). It coexisted with the names גאורגיה ("Gheorghia" with two hard g's) and גורג'יה (Gurjia), when "Gruzia" took over in the 1970s, probably due to a massive immigration of bilingual Georgian-Russian Jews to Israel at that time. In August 2005 the Georgian ambassador to Israel Lasha Zhvania asked that the Hebrew speakers refer to his country as "Georgia" גאורגיה and abandon the name "Gruzia". A similar request was issued by Georgia, in December 2009, to Lithuania, asking to be called "Georgija" instead of "Gruzija"; the request was forwarded to the Commission of the Lithuanian Language. In June 2011, the Ministry of Foreign Affairs of Georgia said South Korea had agreed to refer to the country as “Georgia” instead of the Russian-influenced “Gruzya” and the government of Georgia was continuing talks with other countries on the issue. In April 2015, Japan changed the official Japanese name for Georgia from "Gurujia" (グルジア), which derives from the Russian term "Gruziya," to "Jōjia" (ジョージア), which derives from the English term "Georgia". 1 2 (Armenian) Yeremyan, Suren T. «Իբերիա» (Iberia). Soviet Armenian Encyclopedia. vol. iv. Yerevan, Armenian SSR: Armenian Academy of Sciences, 1978, p. 306. 1 2 Tbilisi Wants to Be Referred as 'Georgia' Not 'Gruzya'. Civil Georgia. June 27, 2011. ↑ "Georgia on his mind: Republic's ambassador demands Hebrew name change". Haaretz.com. 2005-08-08. Retrieved 2009-06-28. ↑ "Gruzija nori būti vadinama "Georgija"" (in Lithuanian). delfi.lt. 2009-12-02. Retrieved 2009-12-02.